The flag carrier of Republic of Singapore, Singapore Airlines has grown from a regional airline into one of the world's leading carriers. With a young, efficient fleet, an educated staff attuned to quality, and a top-ranked travel gateway Singapore's Changi Airport at the centre of their extensive route network. Singapore Airlines first started out as Malayan Airways Limited or MAL and was founded on October 12, 1947 by the Ocean Steamship company of Liverpool. The first MAL flight to operate was actually a chartered flight, which took off from the British straits in Singapore and landed in Kuala Lumpur. This inaugural flight took place on the 2nd of April 1947. Singapore Airlines has two subsidiaries: SilkAir operates regional flights to secondary cities, while Scoot operates as a low-cost carrier. Singapore Airlines offers best services, on-time and hassle-free operation at the best possible fares! 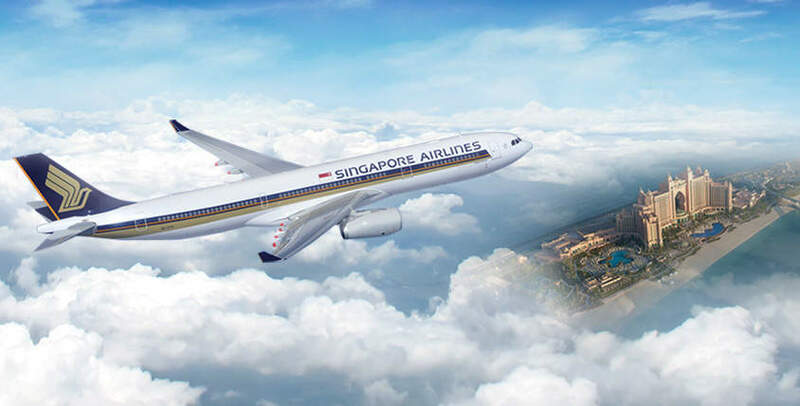 Singapore Airlines currently operates an all wide-body aircraft fleet of four aircraft families: Airbus A330, Airbus A350, Airbus A380, and Boeing 777, totalling 112 registered aircraft. Singapore Airlines flies to 62 international destinations in 30 countries on 5 continents from its primary hub in Singapore. Singapore Airlines is a full cost carrier and its aircraft cabin is divided into four cabin classes. Singapore Airlines Suites is a class available only on the Airbus A380-800. The product consists of separate compartments with walls and doors 1.5 m high. The leather seat is wide and a 23 in LCD TV screen is mounted on the front wall. “New” First Class is offered on refitted Boeing 777-300ERs. Features include a 24-inch in-flight entertainment screen with video-touch screen handsets, arranged in a 1-2-1 configuration, adjustable in-seat lighting, and passenger control unit, inside a fixed-shell cabin with wide seat foldable into a bed. The "Other" First Class is offered only on Boeing 777-300 and unrefitted Boeing 777-300ER aircraft. It features wide seats upholstered with leather and mahogany and a 23 in LCD screen. The seats fold out into a flat bed and also arranged in a 1-2-1 configuration. Features include power socket and ports all in one panel, stowage beside the seat, two new seating positions and an 18-inch in-flight entertainment screen. The seat has recline of 132 degrees and can be folded into a bed. Premium Economy seats have 38-inch pitch at 18.5-19.5 inches wide with an 8-inch recline. They also feature a 13.3 inch high-definition touchscreen LCD monitor and a Book-the-Cook Service. The latest redesign of the Economy Class seat features include increased legroom, slimmer seats, an adjustable headrest, and an 11.1-inch touch screen inflight entertainment system which is also controllable with a video touch-screen handset as well as brand new KrisWorld software. Singapore Airlines offers two primary categories as part of its frequent flyer programs. Points and miles can be accrued and redeemed, not just on Singapore Airlines, but also on any of its KrisFlyer partners. These partners are inclusive of Star Alliance airlines members as well as several car rental companies and hotels. The PPS Club is applicable to passengers with points worth more than 25,000 Singapore dollars. Book tickets for 10 travellers or more with Singapore’s flag carrier Singapore Airlines by FareHawker flight Group Booking desk. We offer Singapore Airlines group fare facility for all travel portal, travel agencies, corporate & tour operator. Our ex-airliner team members are expert in handling small or large segment of Group Bookings. Singapore Airlines Flight Lowest Group Fare - Buy Group flight tickets with FareHawker for booking international airlines group tickets on discounted fare. We are the largest consolidator for Group Air tickets in India and abroad. Post Your Group Booking Query for Singapore Airlines. How to book Group Tickets in Singapore Airlines Flight ? Any traveller, corporate, travel agency or individual can directly mail to FareHawker Group Desk team by asking for Singapore Airlines Airlines flight group fare. Our group booking expert will get back to you on the same trail within 4 hours. Air ticket booking available at lowest airfare for Singapore Airlines flights at affordable prices at FareHawker. Singapore Airlines flight online booking - Book Singapore Airlines ticket online at lowest air fare at FareHawker. Get best offer for Singapore Airlines connecting India and abroad! Book Singapore Airlines tickets with FareHawker as we offer the best-in-class fare options for all types of airline bookings. Our dedicated ex-airliner team with their in-depth industry knowledge offers you the cheapest possible fares for domestic as well as international travel. We take pride in our relationship with the airline partners and it is this relationship that allows us to offer you great travel solutions. We are here not only to find the best flights at cheap airfares but also to offer you consolidated travel services so you enjoy a seamless travel experience. Visit Singapore Airlines FAQ for all related queries. Terms and condition of FareHawker and Singapore Airlines apply.